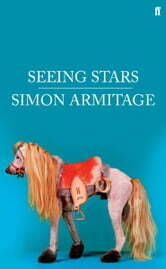 Simon Armitage's new collection is by turns a voice and a chorus: a hyper-vivid array of dramatic monologues, allegories, parables and tall tales. Here comes everybody: Snoobie and Carla, Lippincott, Wittmann, Yoshioka, Bambuck, Dr Amsterdam, Preminger. The man whose wife drapes a border-curtain across the middle of the marital home; the English astronaut with a terrestrial outlook on life; an orgiastic cast of unreconstructed pie-worshipers at a Northern sculpture farm; the soap-opera supremacists at their zoo-wedding; the driver who picks up hitchhikers as he hurtles towards a head-on collision with Thatcherism; a Christian cheese-shop proprietor in the wrong part of town; the black bear with a dark secret, the woman who curates giant snowballs in the chest freezer. Celebrities and nobodies, all come to the ball. thoughts on the rim of the dark crater'. The storyteller who steps in and out of this human tapestry changes, trickster-style, from poem to poem, but retains some identifying traits: the melancholy of the less deceived, crossed with an undercover idealism. And he shares with many of his characters a star-gazing capacity for belief, or for being 'genuine in his disbelief'. Language is on the loose in these poems, which cut and run across the parterre of poetic decorum with their cartoon-strip energies and air of misrule. Armitage creates world after world, peculiar yet always particular, where the only certainty is the unexpected.